With other priorities dominating much of 2017, I didn't visit many shows or swap meets. 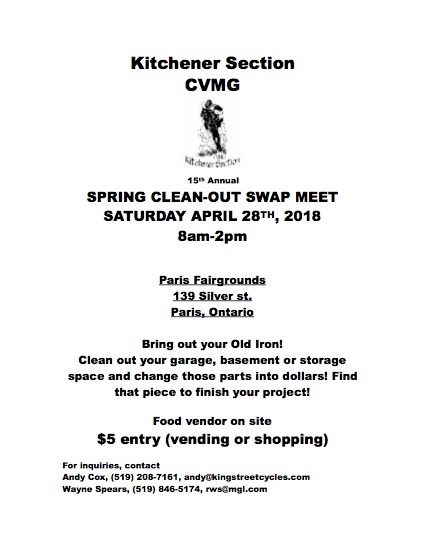 At the 11th hour on Friday, I happened to be cruising the CVMG page and saw the Kitchener branch would be holding court at the Paris Fairgrounds the next morning. I figured I should start making up for lost time. I set out early, as one does to find the best items; Armed with a modest cash budget and list of essentials in mind, I kept my expectations low. Despite the intermittent heavy rain, the number of vendors was fairly high and diverse. What did surprised me was the lack of project bikes for sale. Not a concern for me, as the Inn is currently beyond capacity! 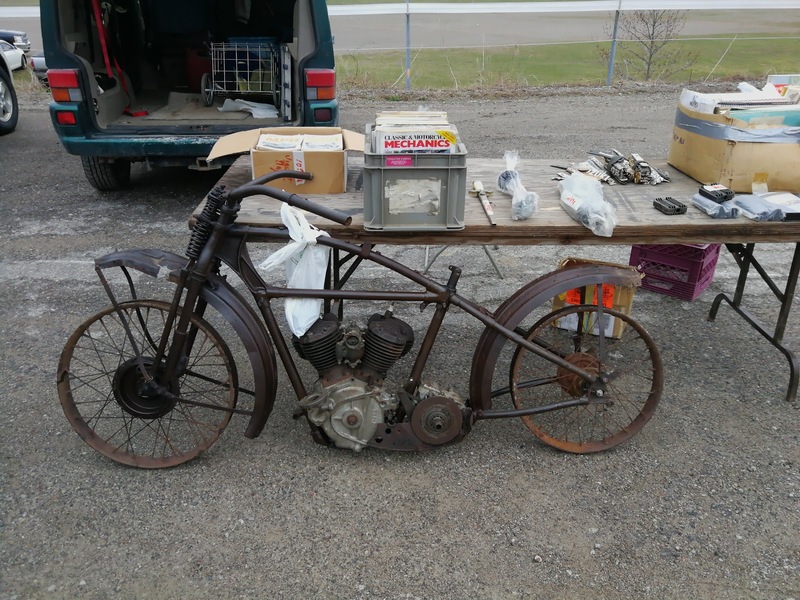 There was one exception and it was certainly something not seen very often, this 1929 Harley Davidson JD project. Considering the age and how much of the bike is present, someone should be able to restore to former glories. At the end of the day, I made out quite well and far better than expected. Below, I humbly present my 'haul'. It may not look like much, however these are all items that I had hoped to find and more importantly, needed. 2 x Shorty/cocktail shaker mufflers (purchased for $2.00!) I have never seen shorties with flared ends before. The chrome is actually quite decent. 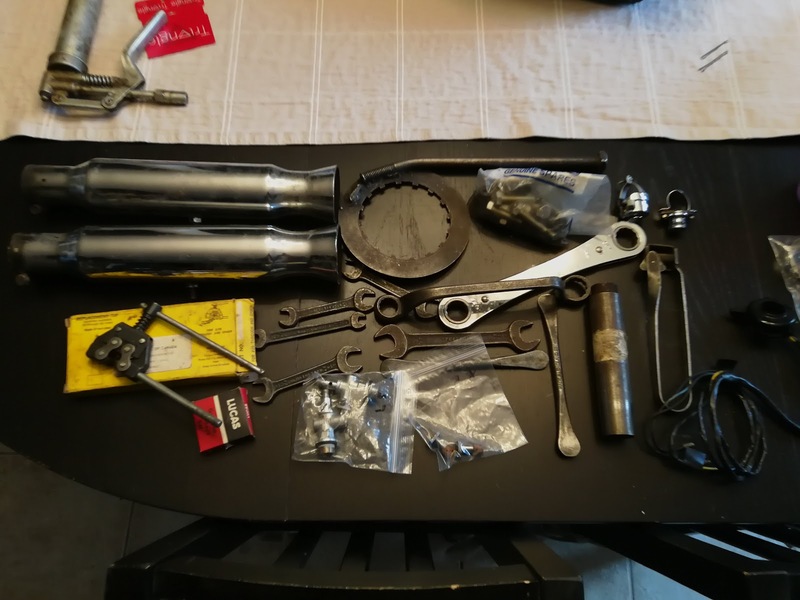 12 x Tools: Several slimline wrenches, a NOS American made chain tool, Dunlop tyre spoons, Craftsman wrench, home made Triumph clutch tool, very old flint for welding and a mystery tool. 1 x Bag of random British fasteners with nuts, always handy. 3 x original handlebar switches, all in excellent shape. 1 x Ducon, 1 x Miller and 1 x Lucas. 2 x Ewarts fuel taps with new components. I was really surprised and delighted to find these as mine are but trash. All in all, a very worthwhile Saturday morning and I will be sure to attend next year. 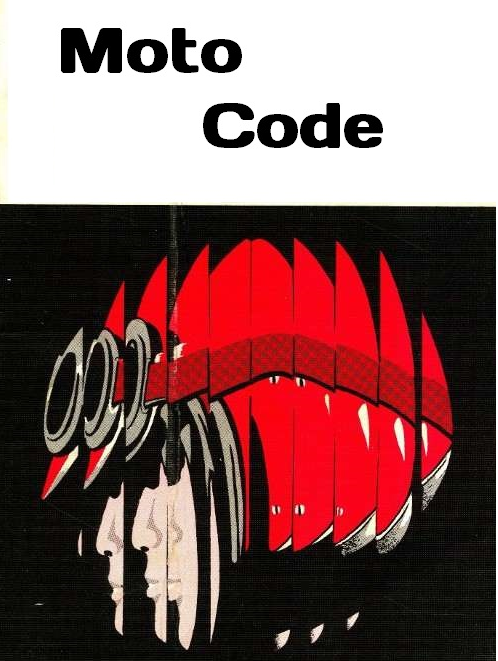 My next post will reflect some project updates, until next time!